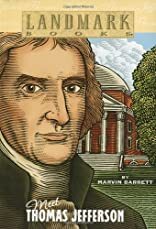 An easy-to-read biography of the third President with emphasis on the creation of the Declaration of Independence. About MARVIN BARRETT (Author) : MARVIN BARRETT is a published author of children's books. Some of the published credits of MARVIN BARRETT include Meet Thomas Jefferson (Landmark Books (Paperback)).